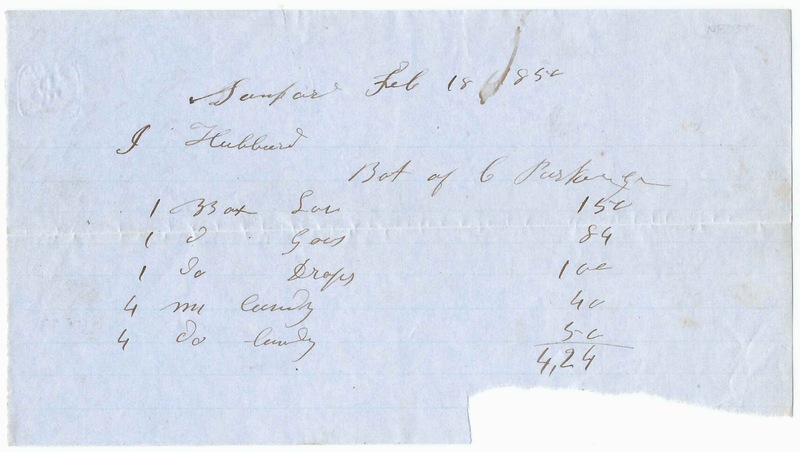 Two 1850 invoices from the confectionery shop of Clement Parker, Jr. of Sanford, Maine. The invoice above is dated November 20, 1850 for the purchases made by George H. Day, who purchased "goos" [? ], stick candy and a box of rose buds. 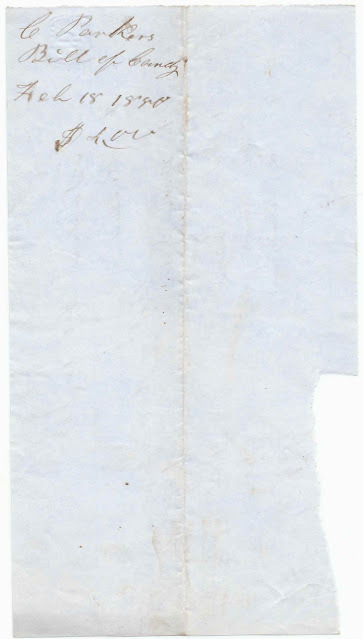 Parker's employee T. Quint, or J. Quint, received payment from Day. The other invoice, dated February 18, 1850 [not sure of last digit] was directed to J. Hubbard and lists purchases of candy, drops, "goos" and what might be an abbreviation for lozenges. This invoice doesn't have a receipt signature. Clement E. Parker, Jr. was born 12 August 1809 at Reading, Vermont, son of Rev. Clement E. Parker and Rachel (Taylor) Parker. On August 17, 1830, son Clement married Maria Hemingway Hubbard, daughter of Jonathan and Frances (Parsons) Hubbard. Maria was born December 11, 1799. They had, I believe, five children. By 1860 the family had moved to Berwick, Maine. Maria died in 1863. Clement then moved to Boston, where the 1870 Census finds him married to Rebecca. He died at Denver, Colorado in July of 1879. 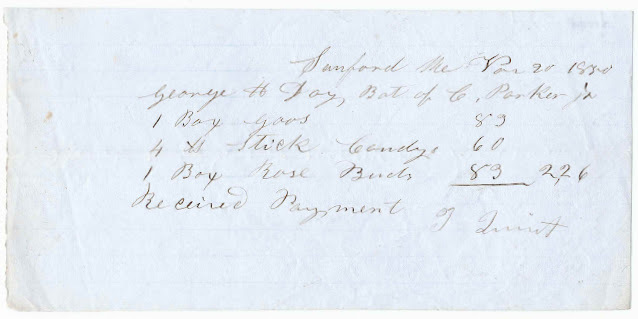 George H. Day may have been the George born 10 August 1819 at Kennebunk, Maine, son of Robert and Mary (Wood) Day, and husband of Ann S. (Adams) Day. They eventually moved to Massachusetts, where George died at Boxford, Massachusetts, on 8 May 1901. Hubbard was a common name in the area, so there are several possibilities for a J. Hubbard. Interestingly, Clement Parker's wife, Maria Hemingway (Hubbard) Parker, had a brother Jonathan, born about 1804. I didn't find a T. Quint in the area, but if the initial is J., there are several possibilities: John, Joseph, Joshua, James, Joanna, etc. If you have corrections and/or additions to the information about Clement E. Parker, Jr., George H. Day or J. Hubbard, or a theory about ? Quint, please leave a comment or contact me directly. Thanks! I seem to recall the Perkins family being involved with a confectionery business. Perkins married a Quint, they resided in South Berwick. Not sure if this Quint is the same family. Definitely coincidences that deserve checking out. Thanks, Richard!